It’s not the perfect moment without the perfect ring. There is no better way to ring in the New Year than picking the perfect Coast Diamond engagement ring from J. Brown Jewelers of Pikesville, Maryland. Serving Baltimore since 1910, the third generation of the J. Brown Jewelers family takes great pride that they can include you in their fine jewelry family after helping you choose the perfect ring. The comfort of their beautiful store, the wealth of knowledge shared during your visit, and the excitement you feel when leaving with the engagement ring of your dreams, is why we choose J. Brown Jewelers as our Coast Featured Retailer this last week of 2016. The J. Brown Jewelers’ Family can’t wait for you to become part of the family in 2017! The J. Brown Jewelers family has grown rather large over the past 106 years. Helping countless couples create the perfect moment with the perfect engagement ring tends to do that. So, what kind of Coast Diamond engagement rings are Baltimoreon couples shopping for? A J. Brown Jewelers’ bride loves lots of sparkle in a classic, traditional style. The Coast Diamond halo engagement ring is the perfect choice for the Baltimoreon bride. These two Coast Diamond halo engagement rings are loaded with brilliant round diamonds. The Coast Diamond Solitaire is stunning with diamonds cascading down the band. Congratulations J. Brown Jewelers for helping countless couples create the perfect moment with the perfect Coast Diamond engagement ring, and for being our Coast Featured Retailer of the Week! History has a way of proving whose best in the business. Through hard work and the dedication of loyal customers, Potter & Anderson Jewelers of Peoria, Illinois has proven to be the best in its 88 years of business. Now, in its third generation of family ownership, they continue to offer high-quality merchandise with exceptional customer service. There is no better place to shop for your loved one than our Coast Diamond Featured Retailer, Potter & Anderson Jewelers. Find the very best for your loved one when you visit the stunning store of Potter & Anderson in Peoria, IL. Every man wants to give the love of his life the best, so propose to her with a Coast Diamond engagement ring. Platinum or rose gold, oval or round, generous or petite, the staff at Potter & Anderson Jewelers will help you find the very best engagement ring for the one you love. The details are Potter & Anderson’s expertise. When you trust them to help you with every detail, you will leave with the very best Coast Diamond engagement ring for her. Could one of these Coast Diamond engagement rings be the one? Radiant Oval Coast Diamond halo engagement ring (LC5410) set in platinum with diamonds glittering on the band. Magnificent cushion-shaped Coast Diamond engagement ring (LC5257) of round diamonds. Petite Coast Diamond cushion-shaped halo engagement ring (LC5410RG) set in rose gold with a matching band (WC5410RG) encrusted in diamonds. Congratulations to Potter & Anderson Jewelers for their longstanding excellence in fine jewelry and gift giving, and for being our Coast Diamond Featured Retailer of the Week! Feel the culture and style of Southern hospitality when you visit Lamon Jewelers of Knoxville, Tennessee. This fine jewelry boutique has been serving customers for three decades. They have a huge selection of GIA certified diamonds to customize your Coast Diamond engagement ring. They can also help you with other ways to make your Coast Diamond engagement ring one-of-a-kind. Begin your lifetime of love with a unique Coast ring at Coast Diamond’s Featured Retailer of the Week, Lamon Jewelers in Knoxville, TN. GIA reports provide a full description of the diamond, including color, weight, measurements, and cutting style, and disclose any known treatments. You know exactly what you are getting with a GIA certified diamond from Lamon Jewelers, no matter the size or shape of the diamond you choose. You can also customize your Coast Diamond ring with your choice of metal. Rose gold is a popular choice today for its warmth and romance. Platinum is a timeless choice for an engagement ring that becomes an heirloom piece for your family in years to come. Bright white gold and classic yellow gold are also available to make your engagement ring uniquely you. 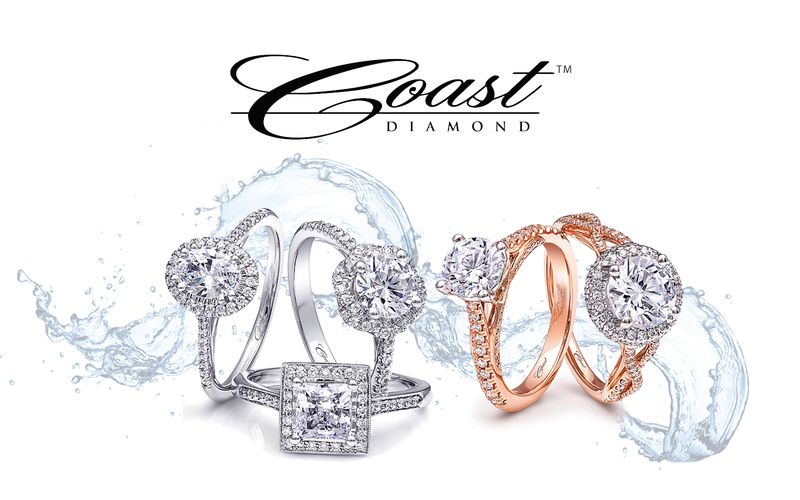 How will you customize your Coast Diamond ring? Coast Diamond oval halo engagement ring (LC10233) with fishtail set diamonds on the band. Click image for details. Coast Diamond cathedral engagement ring (LZ5001H) with graduated diamonds on the band and a peek-a-boo diamond under the center stone. Shown with matching wedding band (WZ5001H). Click image for details. Coast Diamond 1.45 CT wedding or anniversary band (WZ5002) with two rows of brilliant fishtail set diamonds. Click image for details. Congratulations to Lamon Jeweler of Knoxville, TN for being our Coast Diamond Featured Retailer of the Week! For almost 50 years Barons Jewelers of Dublin, California has been serving customers for their fine jewelry needs with a smile. There is nothing like the legacy of joy that both Barons Jewelers and the halo engagement ring have brought to many brides. If you are planning a holiday proposal, find the most elegant and dazzling Coast Diamond halo engagement ring for your bride-to-be at our Featured Retailer of the Week, Barons Jewelers. Barons Jewelers president and owner, Ron Heller, continues the legacy of his father, Bart. He ensures every customer’s exhilaration, after leaving Barons, is contagious. The halo engagement ring was first introduced in the 1920’s. During this time of art deco opulence, an engagement ring with a center stone wrapped in a halo of diamonds was the desire of every bride. Today, the halo engagement ring is a popular choice because of its versatility in style: modest or fantastically over-the-top… or perfectly in between. Coast Diamond has them all! At Barons Jewelers we are sure you will find one of these five Coast Diamond halo engagement rings to be perfect for you. The Coast Diamond cushion shaped halo engagement ring (LC5256) with a diamond encrusted band. Click image for details. The Coast Diamond round halo engagement ring (LC5438) encrusted in diamonds framed by strings of diamonds that twist down the sides of the band. Click image for details. The Coast Diamond scalloped halo engagement ring (LC6026) with fishtail diamonds on the band and milgrain edging around the halo. Click image for details. The Coast Diamond double halo engagement ring (LC10021) with a diamond encrusted split band. Click image for details. The Coast Diamond oval halo engagement ring (LC10233) with delicately set diamonds on the shoulders. Click image for details. Congratulations to Barons Jewelers of Dublin, California for putting a beautiful smile on every customer’s face and for being our Coast Diamond Featured Retailer of the Week! Do you love to surprise the one you love? An engagement ring is the perfect surprise during the holidays. Leslie Jewelers of Searcy, Arkansas has been part of such surprises since 1967. That’s why our Coast Diamond Featured Retailer of the Week, Leslie Jewelers of Searcy, AR is the perfect place to start your plans to Surprise Her this holiday season. When sisters, Amy Maxson and Melanie Purnell bought Leslie Jewelers from their aunt and uncle, the sisters were excited to carry on the iconic tradition of excellence they had created. These are all things we hear about Leslie Jewelers and just what you should be looking for when you are planning to Surprise Her. Amy and Melanie, along with Master Jeweler, Robert Pitard can’t wait to meet you and help you find a stunning engagement ring to Surprise Her this holiday season. Leslie Jewelers: Sisters, Amy Maxson and Melanie Purnell are joined by Master Jeweler, Robert Pitard Leslie Jewelers, Searcy, AR. At Leslie Jewelers everything is Merry and Bright with Coast Diamond for Holiday engagements. If you are planning to Surprise Her with a holiday proposal start with a Coast Diamond engagement ring at Leslie’s. Nowhere else in Arkansas can you receive the customer care and expertise in fine diamonds as you will at Leslie Jewelers. A GORGEOUS CLASSIC Coast Diamond wedding set (LS10005-WS10005) with a 1 CT solitaire and brilliant fishtail-set diamonds to hug the finger. Click image for details. AN EYE-CATCHING VINTAGE Coast Diamond 1.25 CT double halo engagement ring (LC10130) accentuated with a split shank of pavé diamonds. Click image for details. A STUNNING BOLD 2 CT Coast Diamond halo engagement ring (LC10072) with 3 rows of fishtail and prong set diamonds. Click image for details. Congratulations to Leslie Jewelers for their exceptional customer reviews and for being our Coast Diamond Featured Retailer of the week!